Dubai, United Arab Emirates, 16 April 2018: ENBD REIT (CEIC) limited ("ENBD REIT"), the Shari’a compliant real estate investment trust managed by Emirates NBD Asset Management Limited (the "Fund Manager"), has announced that it has applied the Internet-of-Things ("IoT"), machine learning and Artificial Intelligence ("AI"), in partnership with EP&T Global, to deliver energy savings at Al Thuraya Tower 1, its office building in Dubai Media City, as part of its overall strategy to adopt green initiatives. 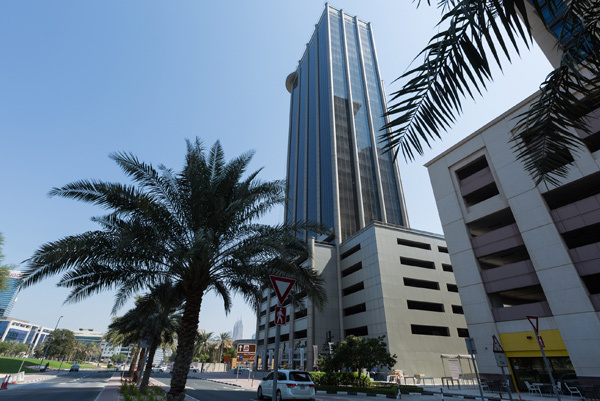 Al Thuraya Tower 1, which has 28 floors covering 18,000 sqm of commercial office space, has deployed EP&T Global’s innovative EDGE Zeus technology to deliver operational energy efficiency throughout the building. The cutting-edge system combines big data analytics, machine learning and Artificial Intelligence to achieve cost reductions and improved comfort conditions. Having established EDGE Zeus technology in Al Thuraya Tower 1, ENBD REIT will now look to apply similar initiatives across its property portfolio over time. "We're pleased to announce the launch of EDGE Zeus technology at Al Thuraya Tower 1, in partnership with EP&T Global - the systems provider - and with the support of Operon Middle East Facilities Management, who run the building. From an asset management perspective, we have always been committed to delivering ENBD REIT’s green initiatives, without compromising on comfort or building quality. This innovative and industry-leading energy saving technology will enable us to do exactly that, and we look forward to further green drives in other parts of our portfolio." By processing over 4.5 billion data sets per year, the EDGE Zeus technology creates an interactive view of a site’s data universe by collecting, analysing and interpreting big data to deliver actionable information for facilities management teams to achieve efficiencies and cost reductions. 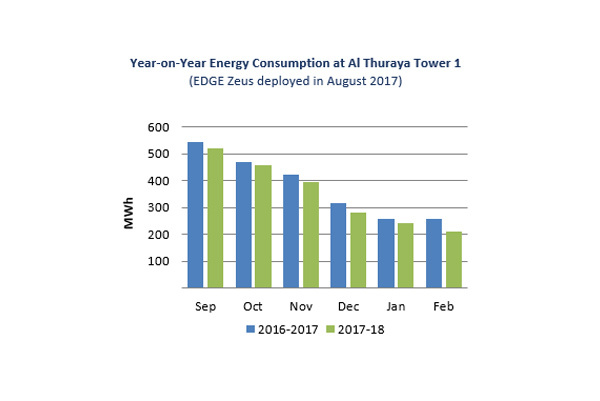 Since installation at Al Thuraya Tower 1, EDGE Zeus has identified over 30 energy savings opportunities worth AED 250,000 and reduced energy consumption by 7%. Through the realisation of additional energy saving opportunities, this project is expected to deliver a return on investment of 30-40%. "We’re delighted to be partnering with the ENBD REIT team to improve the energy efficiency of their buildings. A key ingredient to the success of a project like this is the integrated approach of EP&T Global with the asset and facilities management teams, bringing owners, contractors and service providers together to maximise the operational efficiency of the building and enhance comfort conditions for occupiers. All actions resulting from our system are based on high fidelity data and occur in real time, delivering an essential value add for landlords and tenants alike"
"Key benefits to this project will include a projected return on investment of up to 40%, as well as significant greenhouse gas emissions reduction, which is an increasingly important objective for ENBD REIT as it works to reduce the carbon footprint of its portfolio. At the same time, commercial tenants at Al Thuraya Tower 1 will enjoy greater levels of comfort." ENBD REIT's total property portfolio value stands at USD 460 million (AED 1.7 billion), following acquisition of The Edge in Dubai Internet City in October and the Souq Extra Retail Centre in Dubai Silicon Oasis in December. In 2017, all four of ENBD REIT’s acquisitions were 100% occupied on long-term leases. ENBD REIT is a leading Shari’a compliant Real Estate Investment Trust, holding properties across Dubai’s office, residential and alternative asset classes. As at 31 December 2017, the Company’s Net Asset Value (NAV) was USD 300 million or USD 1.18 per share.